Life-changing inpatient services became available in Mecklenburg County when the State Employees’ Credit Union Youth Crisis Center (SECU YCC), a Monarch program, opened its doors one year ago. Prior to YCC, no such inpatient facility existed in North Carolina for children and teens, ages 6 – 17, who require and benefit from crisis mental health services. The McKoy family’s eldest daughter is one of more than 400 admissions since YCC’s opening day. Imani McKoy, 11, shared how this new facility made a positive impact on her family in an effort to share a glimmer of hope for other families who need it. Imani has a one-of-a-kind, animated voice and beautiful smile that lights up her face. Social studies is her favorite subject in school. Her compassionate and caring nature helps with the responsibilities that come with being the eldest sister. She loves to swim, rock climb and horseback ride. She loves babies, dogs and cats. Imani’s voice becomes a bit softer when she recounts the bullying she experienced from both teachers and classmates last year at her former school and that ultimately led to her referral to the YCC to seek treatment for suicidal ideations in May 2018. Imani was diagnosed with anxiety, attention deficit/hyperactivity disorder and trichotillomania, which is the irresistible urge to pull out hair. After her first stay, Imani was able to identify the triggers of her negative behaviors and implement means of self-control. “I learned that I should be me and other people might just be jealous. It’s ok to be you and I am not the bad names that they call me,” she added. “Sitting down and talking to the therapist is what helped me the most while I was there,” Imani confided, while squeezing an orange, foam ball that helps her relax but admits that she struggled a bit with sharing during group therapy. Imani’s second stay at the YCC came in October 2018, where therapists reinforced what she learned previously with new coping skills like listening to music and implementing daily affirmations, also known as cheerleading statements, in the mirror. “When I get really angry I say to myself, ‘You look nice today,’” Imani explained of a technique that helps calm her. Now a sixth grader at Kannapolis Charter Academy, she says things are getting better because the support system at her new school and her family take a stronger stance against bullying. Cecelia McKoy Graves, Imani’s mom, is active in the Cabarrus County chapter of Mental Health America of the Central Carolinas and acts as an advocate not only for her daughter, but also for families who are navigating the world of mental health services in North Carolina. During both of Imani’s stays, Graves appreciated receiving up-to-date, accurate information about how Imani was doing and being offered strategies for a smooth transition back home. “The team at the YCC involves the family. Within the first 24 hours, we were planning on what was going to happen and what the expectations were. I had a roadmap. They kept me involved,” added Graves. Imani continues on her path to improving with outpatient psychiatric support from Monarch’s Lexington behavioral health site in tandem with Nazareth Child and Family Connection in Salisbury. 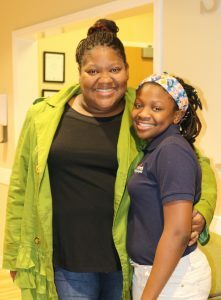 Photo caption: Cecelia McKoy Graves and daughter Imani are grateful for services received at the SECU YCC.